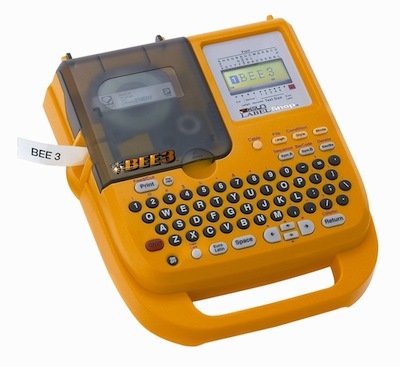 The K-Sun BEE3 is a portable, compact keyboard Label Printer that creates custom adhesive-backed labels in over 60 different size and colour combinations. The K-Sun BEE3 also prints on polyolefin heat shrinktube material for wire and cable identification. Packed with features that you’d expect only from larger more expensive printers the K-Sun BEE3 includes 6-Bar Code formats, 14 fonts, 1028 Special Industrial, Medical, Safety, Office, Home and General Symbols, Punctuation, Maths, Arrows and more. The K-Sun BEE3 also includes Automatic Tape Cutter, Auto power off and the option to use printer with DC Auto & Truck Adapter-12V (sold seperately) makes this printer power efficient and versatile. The K-Sun BEE3 has a special 3 Year Warranty and comes with a Free AC Power Adapter, 6 “AA” Batteries, Free Nylon Wrist Strap and Tape Liner Cutter Tool.